Tower clocks are traditionally large mechanical weight-driven and pendulum-regulated clocks. These public tower clocks are often a building’s crowning glory and a memorable landmark or reference point of the rural or urban skyline. 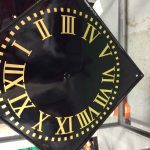 Tower Clock restoration is a particular specialism for our team of highly skilled clockmakers; we’ve faithfully restored thousands of clock towers and turret clocks and, if required, also given our clients the benefits of modern clock systems. The term ‘Turret clock’ refers to the mechanism inside the clock tower and often marks the hour by sounding chimes or bells. 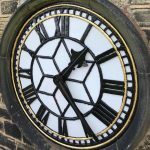 We have a range of standard turret clocks for installation in existing structures such as barn conversions and private residences. Our design team can also work with you to create a bespoke tower clock integral to your scheme. We’re proud to have manufactured and installed the world’s largest pendulum regulated clock for the Harmony Tower Clock in Ganzhou, China. According to the Guinness World Records. The Harmony Clock Tower in Ganzhou is a great example of an exterior clock tower. This tower clock was designed and manufactured by our Smith of Derby clockmakers at our workshop in Derby, in 2010. It has dials measuring 13 metres in diameter and a minute hand 7.8 metres long.